Elite League champions Sheffield Steelers are gearing up for what is being dubbed as the ‘biggest game of the season’ as fierce rivals Nottingham Panthers come to town on Saturday. The clash at Sheffield Arena will be the first of eight Elite League meetings between the two sides this season and the hosts are urging supporters to create an intimidating atmosphere for their visitors by making the stands a sea of orange with jerseys and flags. 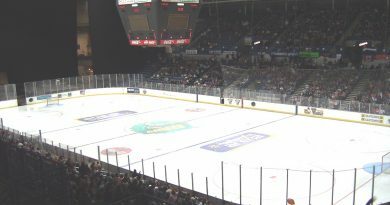 Those who can’t be there will be disappointed as Steelers have confirmed that there will be no webcast of the match or any others between themselves and the Panthers in the near future due to a dispute with commercial establishments in Nottingham who use the service. The two have met twice in the Challenge Cup this campaign with a win for both teams – Steelers won the first meeting 7-5 at Sheffield Arena in September, but the Panthers won 4-3 at the National Ice Centre in Nottingham a week later. But it is the Steelers who have had the bragging rights lately in the Elite League – the back-to-back champions have won all of the last three meetings since the turn of the year, including a 4-2 win in Nottingham in March last season. But despite an impressive recent record against their biggest rivals, the Steelers and head coach Paul Thompson will be weary of a repeat of last weekend’s thrashing in Scotland. Thompson’s men were on a run of five successive wins in all competitions until a shock 4-0 defeat away to the league’s basement side Dundee Stars on Sunday, which was only their second league defeat of the season. They’ll be looking for a response against the Panthers before travelling north of the border to face Dundee again the following evening. Over 6,000 spectators are expected to be in attendance on Saturday night and a limited amount of tickets are still available online and over the phone by calling 0114 256 5656.